Here is a List Of Best Free Software to fix blurry pictures. These software let you unblur different types of photo blurs, which includes: Out of focus blur, Motion blur, and Gaussian blur. These software have options to auto fix blurry photos or deblurr photos manually. You can unblurr photos with low, medium, and high blur factor, with the mentioned deblur software. While some of these software are advanced and let you smoothen images after deblurring them, some only let you fix blurry pictures. Excluding one software mentioned here, which is a photo editor, all of these are dedicated deblurr tools. The process to carry out deblurring is easy with these software, and almost anyone can unblur photos with these software. To your rescue, I have also included the brief steps on how to fix blurry pictures with these software. Go through the list to know more about the listed software and pick the one you like. All of these software are absolutely free to use. Out of the mentioned Deblur software, I like Deconvolution and DeblurMyImage the most. Deconvolution and DeblurMyImage provide manual tuning options with real time preview. I prefer Deconvolution more because it gives a bunch of deblur methods to fix blurry photos, and a Pro would love to use it. You can also checkout the list of best free Software To Watermark Photos For Windows, Photo Recovery Software For Windows, Panorama Software For Windows. 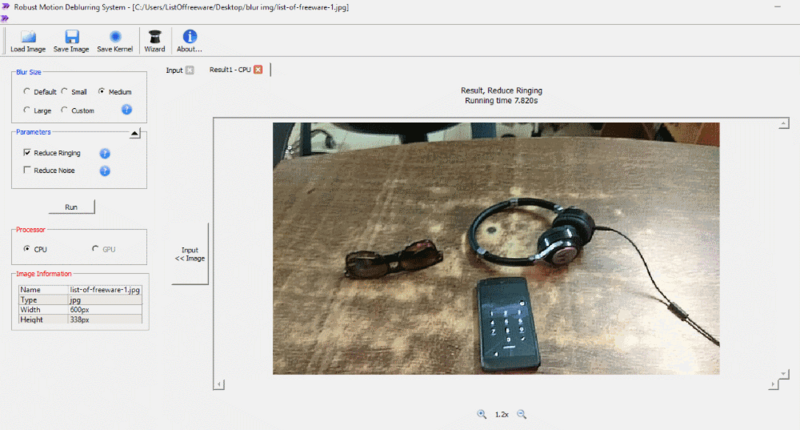 Deconvolution is an advanced and open source image deblur software, which can unblur photos that are out of focus or shaky. It has a number of optimization methods to fix blurry pictures. It lets you manually tune various parameters to get an image deblurred to exact requirements. Load an image which you want to unblur. 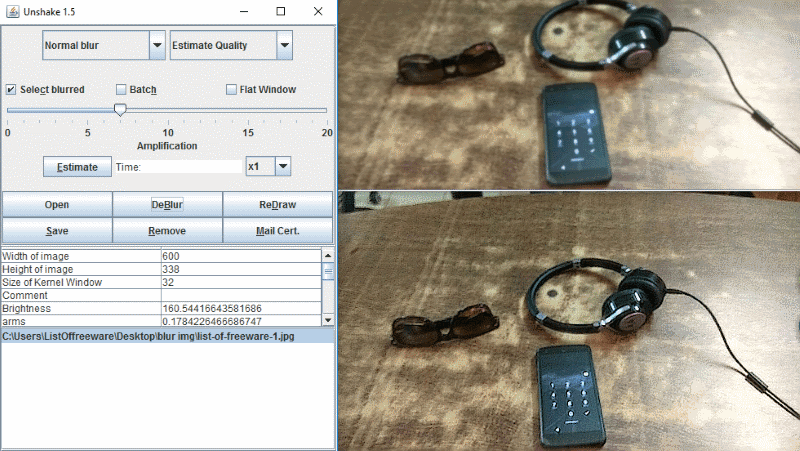 The trick to unblur images here is to do hit and trial on the Optimization Methods for various images. If you are a pro, you will know which method to use. The methods are: Wiener Filter, Tikhonov Regularization, Conjugate Gradient, Gaussian Prior, Native Edge Enhancement, Convolution, Progressive, etc. For the image I unblurred here as test, has many edges, so I went on with Native Edge Enhancement method. Now try to fix the image with the help of Height, Width, and Rotation adjusters. According to the methods you select, you will have to adjust either Smoothness, Iteration, Reweighting, or Edge. Keep adjusting the parameters, and click on Deconvolution to apply the changes. Once done, go to File and save the image. You can deblur jpg, png, and bmp images here. DeblurMyImage unblurs photos very easily and does not needs you to be a pro to be able to use it. It carries out correction on photos that are Out Of Focus or Motion blurred. You just have to load a blurred image, then select the mode of correction, and set the level of details using its slider. A Preview option is available to view the changes in real time. For more detailed processing, options to choose from Progressive and Smoothing methods can be selected. Deblur power can be set as Low, Medium, or High, depending upon the image. Click Ok to apply the changes to the whole image, then save it. The resulting deblurred image was pretty clean and noise free. Robust Motion Deblurring Software is an image deblur software which specializes in unblurring motion blurred images. You can deblur photo precisely or based on levels of blur. If you have GPU installed on your PC, you can make use of it to run the process, making the deblur process more precise. Load an image, and select from the following levels of blur: Small, Medium, or Large. The Custom option lets you precisely adjust levels based on Height and Width. You can also select the option to reduce Noise. The resulting output is displayed in a new tab. Save image as JPG, BMP, or PNG. You can also save image Kernel as PNG file. Let me put it to your notice that the trial version is is available for free. It has no other limitation other than that the output images can be saved in a maximum size of 800×800 pixels. SmartDeblur is another simple deblur software to fix blurry pictures on PC. This software can help you significantly fix blurry pictures. If your image is out of focus, motion blurred, or Gaussian blurred, you can use this free tool to do so. Precise result can be obtained by adjusting Radius, Smoothness, Correction Strength, and Edge feather. You can save an image in PNG or JPEG formats. The latest version of SmartBlur is not a free version and has more precise processing options to unblur images. This free version is 1.27 and is available for free on GitHub. Unshake is a free image deblur software, with very basic options to deblur images. To your surprise, this simple tool will work pretty well to cleanup normal as well as severely blurred images. Although it unblurs images, it does not have image smoothing option, which leaves the images sharp. This tool can be really helpful if you want to extract text from a blurred image or just want to view details. You can deblurr a single image or deblurr multiple images at a time with this tool. To begin with the process, select the severity of blur from Normal or Severe. Now select the image type from: Basic, Portrait, Estimate Quality, or Scenic. Now you will have to set the blur amplification factor from 0 to 20. Keeping the amplification to 5 will unblur a normal blurred image; increase the factor as the blur becomes severe. Now, load the image to deblur and click on DeBlur option. The processed image is displayed in a new window; click save to save the copy of processed image on PC. You can only process and deblur JPG, GIF, and PNG images. Photo! Editor is a free photo editing software with a bunch of tools, which includes an Unblurr tool, Red-Eye removal tool, Denoise tool, Caricature tool, Makeup Tool, etc. Lets talk about the Deblur tool. Open an image then click on the Deblur option. You can either run an Auto deblur process or Manual deblurr process. The Auto process simply detects the image and processes it automatically. The output of auto mode is satisfactory and works best with images with low blur factor. The Manual process lets you carry out Deblurring or Sharpening. Manually adjust Strength and Radius with respective sliders. Result can be previewed right on the screen. Click Ok, then save the image in desired image format. An Instant help window is available on the right side in case you are confused with the process.